T he only thing harder than fi nding a needle in a hay- stack, is fi nding the sharpest points in a haystack full of needles, which is essentially the situation to- day on most vessels. Awash with hundreds or thou- sands of data sensors and data points, it’s the rare ship master or management team that can be certain they are culling the right information needed to cut costs and increase effi ciencies to the extent possible in order to stretch razor thin operating budgets and goose tight profi t margins. Whether they know it or not, this is exactly the position that shipping companies fi nd themselves in these days. All those sensors on all those systems – collecting and recording hundreds or thousands of data points a second, per day, each month – are building ever bigger digital piles, fi lling virtual bottomless cargo holds with shiny points of data. It’s just sitting there, an untapped resource going to waste instead of informing strategic business decisions and heading off expen- sive repairs and fi nes. The problem isn’t collecting the data; it’s not even understand- ing what to do with it. It’s twofold, really. First, is just fi guring out how to assess and analyze what you’ve got in order to pull out and focus on the salient bits that will enable ship company man- agement and vessel masters to meet objectives – be it better fuel effi ciency, lower fuel costs, longer equipment life cycles, lower maintenance and replacement costs or better environmental com- pliance – by making the right decisions in a timely manner. Beach, VA, comes in. Founded by former U.S. Navy engi- neers, it provides cloud-based, remote condition monitoring and data analytics to enable clients to address environmen- tal, fuel, energy and maintenance issues at both the vessel and fl eet level, while also providing ship managers with “action- able” information by automatically analyzing a broad swath of data using a variety of reporting and comparison tools and dashboards. ESRG’s OstiaEdge monitoring suite supports us- ers on ship and on shore, across multiple platforms and server options. The company also provides custom application and consulting services. The second problem lies in convincing a conservative indus- try, one often described as being in the Stone Age technologi- cally, to leap forward more fully into the digital age and invest in the tools needed to sift through all that data. “Shipping is an old industry that has been around for thousands of years, with shipping companies that have been around for hundreds of years. It’s sometimes slow to jump on the next big thing. The market of ships well suited for remote monitoring or using the cloud to analyze data is about 30,000 out of 100,000 commercial class vessels globally. Bradenham expects to see the market double, if not triple, in the next 15 years or so, not- ing that the vast majority of new builds are prime candidates. The standard for new vessels is such that they have good sen- soring on board, good automation and control systems and good communications structures. 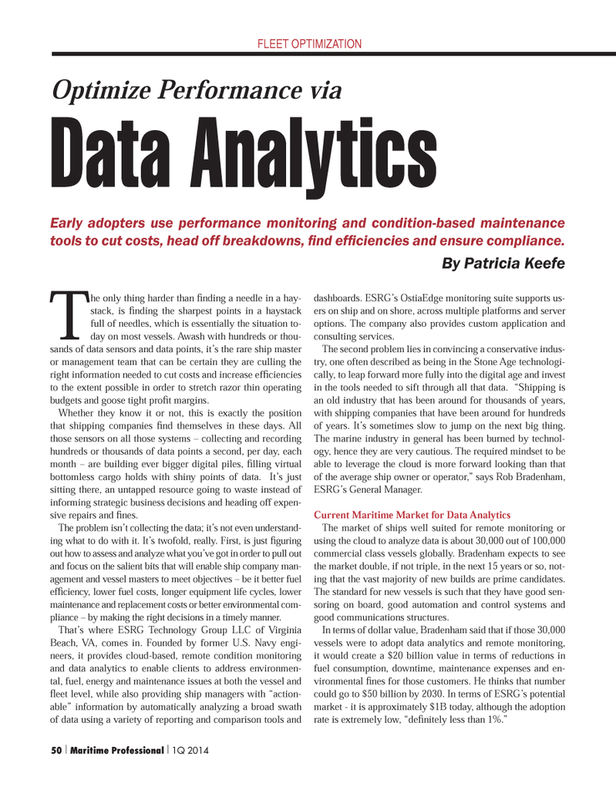 Early adopters use performance monitoring and condition-based maintenance tools to cut costs, head off breakdowns, fi nd effi ciencies and ensure compliance.